Mary Peterson was raised on a farm in Iowa, painting and drawing from life with her mom. Nature, both cultivated and wild, continue to inspire her work. She is a freelance illustrator and artist living in Los Angeles, California, with her husband and too-fat cat. 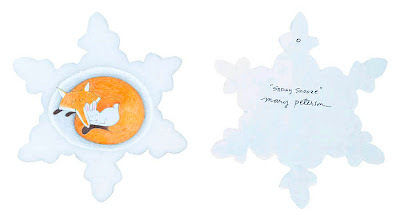 Her snowflake is called "Snowy Snooze," and while Sean Qualls's snowflake made me want to walk through the woods on a snowy, silent day, this snowflake is what I'd want to come home to. It will be part of the first wave of auctions starting in just ten days now, November 19! 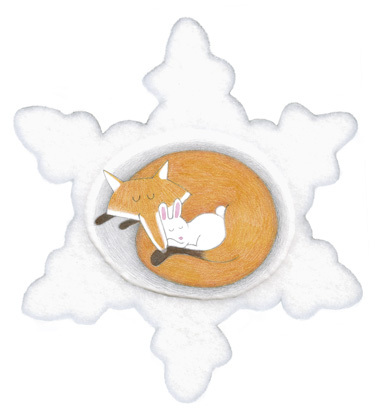 For more snowflakes from the past week, see the sidebar on Jen Robinson's Book Page. And one followup to my post on Sean Qualls: He launched his own blog recently and posted the two pictures from his postcards -- which I completely misremembered. But they're still beautiful. For the last time: FIGHT CANCER! BUY SNOWFLAKES! YEAH!